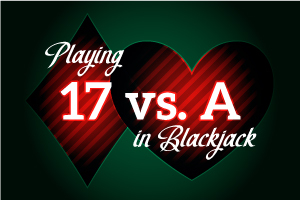 You are playing in a multiple deck game, where the dealer is required to stand on soft 17. You are dealt an eight and a nine for a two card total of 17, and the dealer draws an Ace as his hole card. The dealer checks for blackjack and does not have it. What should you wind up doing in this situation? Well, the correct play is to STAND on this hand. You know, some players actually think real hard about this decision, because of the fact that they fear the dealer is going to be unbeatable with the Ace showing; that is unless they take a chance and hit the hand. And you will indeed win about 20% of the hands if you wind up hitting here, compared with about 17% winning hands if you stand. The key here, though, is the appreciable difference between your rate of losing with regard to the two different options. If you decide to hit the hand, you're going to wind up a loser 75% of the time. Of course, that's because there are only a few cards that can help you in the first place, namely the Ace, deuce, three and four. By contrast, when you stand on the hand, you're going to lose about 64.5% of the time. That's a savings of over ten losing hands per hundred! Always remember the cardinal rule - when you have a hard, pat hand, make sure you stand on it! !